65 million years ago, the Earth suffered an extinction event which removed around 50% of all living species on the Earth, including all non-aviandinosaurs (more on that little detail later). The K-T extinction (or recently renamed the Cretaceous-Paleogene extinction) occured over a geologically short time span (between 100,ooo and 2,000,000 years) but left almost no major animal group without some casualties. The non-avian dinosaurs are the most famous, but a whole range of other important groups went extinct. So, what didn’t make it through the event? Non-avian Dinosaurs – Having been the dominant group of organisms on land for the past 135 million years, the dinosaurs were a very diverse and highly evolved group. Present on every continent, they occupied very complex food webs and ecologies. They were almost certainly warm-blooded (endothermic – generate their own body heat via respiration) and this would have made them reliant on a good and steady food supply. Dinosaurs had already been in decline for approximately 10 millions years before the K-T event, but what was the last straw? 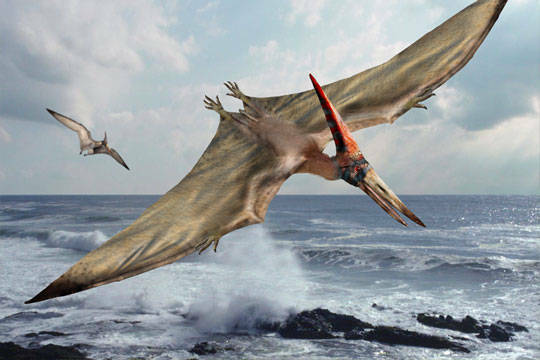 Pterosaurs– Often thought of as dinosaurs or early birds, pterosaurs were in fact a group of winged reptiles that had their heyday in the Jurassic period, but were still present right up until the end. 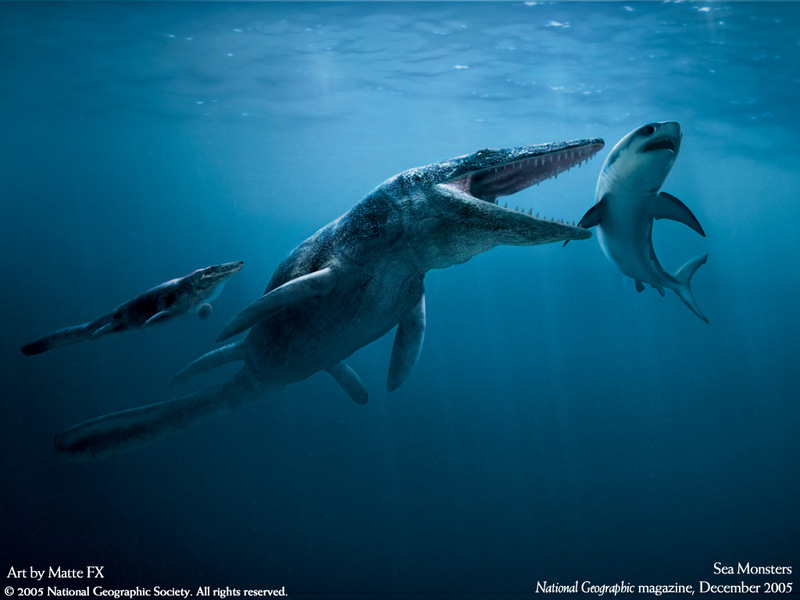 Marine reptiles– large marine reptiles such as plesiosaurs, mosasaurs and icthyosaurs didn’t make it through. Ammonites – these large marine molluscs, easily found as fossils across Britain, had been very common right up until the K-T event, and then the entire group went extinct. Their closest cousins, nautiloids, survived however. Avian Dinosaurs – Avian dinosaurs, or birds as they’re usually called, survived the event relatively intact. There were some species that didn’t make it, but the vast majority did. Crocodiles – a distant relative of dinosaurs, crocodiles and alligators survived the mass extinction event, probably because their feeding habits and ability to burrow a little helped them through tough times. Mammals– Luckily for us mammals made it through. 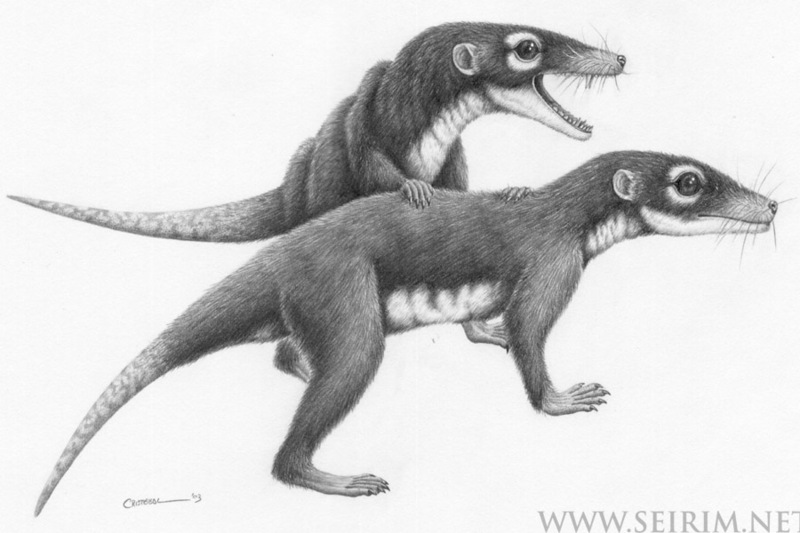 At the time mammals had yet to diversify, and would have resembled rat-sized and rat-shaped animals. Whilst some groups took a hit (for example, marsupials), on the whole the group survived well. Fish – the vast majority of fish survived the K-T extinction, although sharks did a little worse than bony fish. Amphibians – Frogs, newts and salamanders seem to have gotten through relatively unscathed, although their rather incomplete fossil record makes it difficult to draw strong conclusions. There were other groups of course, but I’ve just focused on the main ones. So, what exactly happened to cause the loss of so many species, in such a short space of time? And why did some groups go extinct whilst others were able to cling on? 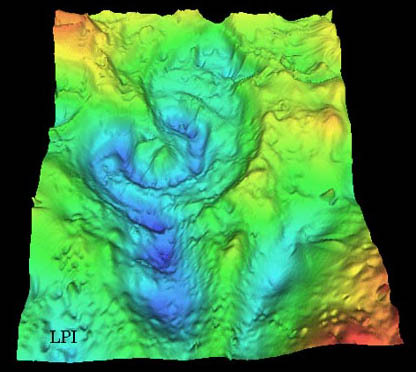 Palaeontologists and geologists have found evidence of three major environment changes that occur around the K-T event. How could they have caused an extinction? 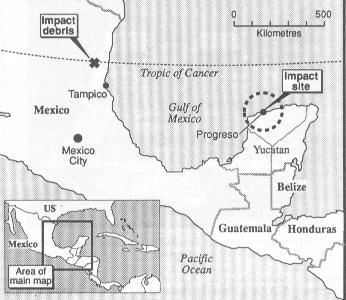 65 million years ago, the Earth was struck by an asteroid, hitting the ocean in what is now part of Mexico. The asteroid was approximately 15km wide and released the 420 ZJ of energy (that’s the same as 1 billion atomic bombs). This would have caused mega-tsunamis, massive wildfires across the Americas and the complete destruction of any large living things within 2000km of the impact. The most significant event however was the large amount of sulfur dioxide and other debris flung up into the atmosphere. This would have blocked the sunlight completely for about a year, and then reduced the amount of sunlight arriving by 20% for 10 years. This would have had a huge and very detrimental effect on any plants trying to photosynthesis, and would have severly disrupted any food chains. 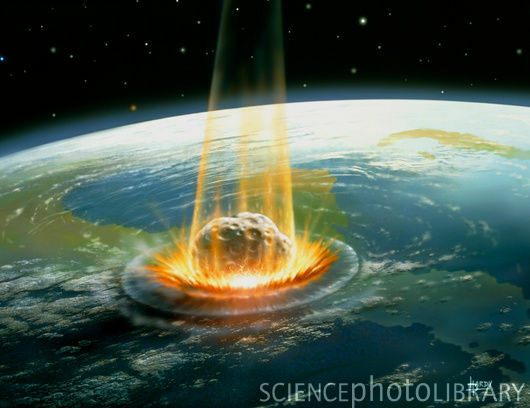 Evidence such as the crater, global layers of iridium (a metal rarely found on Earth) and deposits from mega-tsunamis show this event definitely happened, and currently most palaeontologists think that it is the main contributor to the extinction. The Deccan Traps are flood basalts (a rock formed from volcanic eruptions) from before the after the K-T event near Decca, India. Produced by over 800,000 years of eruptions, these rocks show that there was massive volcanic activity at the time and this would have contributed to any gradual decline, as well as hindering any recovery. Producing large amounts of ash would reduce sunlight, and therefore photosynthesis, and there is evidence that chemicals released during the eruptions (e.g. 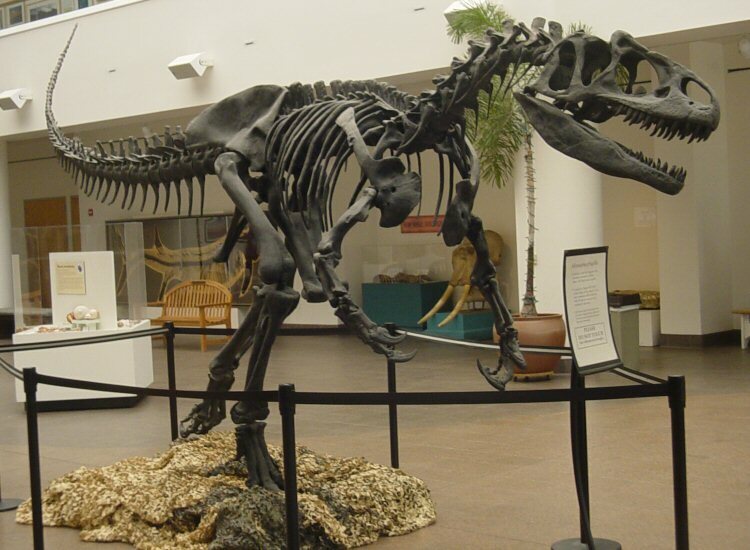 selenium) may have interfered with the production of eggs in dinosaurs). 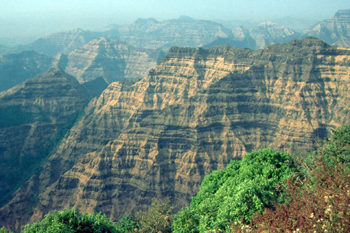 However, recent evidence has suggested that whilst the Deccan volcanism would have cause signficant problems, it wasn’t enough to cause the extinction. 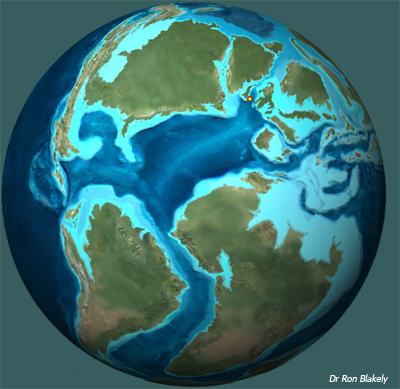 Towards the end of the Cretaceous, sea levels dropped considerably and this mean that large stretches of coastline were lost, along with the species that lived there. This would have severely stressed marine ecosystems, as well as organisms that lived near the coast (including dinosaurs). So, what happened to the dinosaurs then? The likely scenario is that sea-level changes and massive volcanism was causing environmental stresses globally. Reduced photosynthesis and loss of habitats meant that food chains became stressed and more vulnerable. Large demanding animals, such as non-avian dinosaurs, felt the effects first and struggled to find enough food. The same went for large organisms in the oceans. If you were small, or could scavenge and get by on detritus (dead organic matter) you had a better chance. Then, when the asteroid hit at Chicxulub it was enough to add that last bit of environmental stress, and pushed many already-vulnerable groups over the edge and into extinction. So the dinosaurs are well and truly extinct then? Well, actually, no. You’ll notice that I’ve referred to dinosaurs as ‘non-avian’ dinosaurs, and to birds as ‘avian’ dinosaurs. Birds actually share a direct, unbroken lineage to small carnivorous dinosaurs. This is supported by excellent fossil evidence (of feathers, bone structure, sleeping posture and more) and also DNA evidence that shows that birds are dinosaurs. In fact, the classification that birds belongs to (Avialae) is actually part of the Dinosaur superorder. So, the next time you watch a crow walking across the lawn, imagine it without any feathers and you’ll see exactly how similar they are to their ancestors. So, to answer the question ‘What happened to the dinosaurs?’, the answer is they grew feathers, wings, and started chirping! The (Long Term) History of St Albans – what’s beneath our feet? Imagine you had a time machine. You park it out on the main lawn and then programme it to go backwards in time. Unfortunately you doze off, and when you wake up 112,000,000 (112 million) years have gone by (that’s 40,880,000,000 days). What would the world look like? Luckily, there’s a way to find out. The rocks beneath the school record millions of years of history, recording evidence of the environments and organisms that have occupied the very spot that our school now fills. So, what exactly would you find? The drawing below shows an approximation of the geology beneath the school (the ages are approximate and it’s not to scale). The lowest rocks shown in this cross section (and there are deeper, older ones, not shown) are called the Gault Clay. They were formed about 112 million years ago. That was during the Cretaceous period. On the land dinosaurs were going about their business, but at that time most of southern Britain was underwater, covered by a sub-tropical sea. The water was relatively calm, which is why fine sediments like clay could be deposited. In some places, the current was a little stronger and sandy deposits were formed (these became the Upper Greensand). 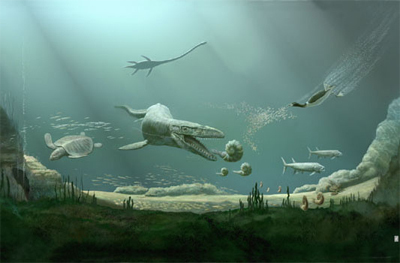 If you sat in your time machine, deep beneath the waves, you would have seen a rather impressive array of now-extinct animals – molluscs like ammonites and belemnites, and large carnivorous marine reptiles like ichthyosaurs and plesiosaurs. You set your time machine to tick forwards, slowly, watching things change around you. 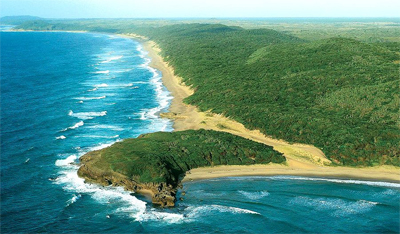 Around 99 million years ago the seas become deeper and now no material reaches the sea floor from the distant coastline. Instead, the skeletal remains of algae form a steady ‘rain’ of particles, slowly settling onto the sea floor. 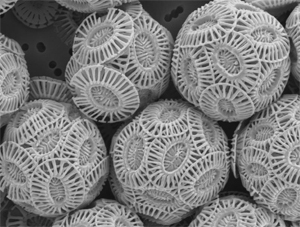 These tiny plates of calcium carbonates are produced by algae near the surface, and are called coccoliths. Their remains will eventually form chalk, and in Hertfordshire the chalk is approximately 220m thick. Considering that each coccolith plate is 0.0025 mm in size, that’s an awful lot of algae needed to produce a huge amount of chalk (incidentally, the chalk that forms the White Cliffs of Dover is of the same age). At the end of the Cretaceous movements of tectonic plates formed the Alps in Europe, and the rocks in the entire region were folded, tilted and changed. Southern Britain didn’t escape unaffected, and the sea floor was shoved up until it became land. Then, erosion and weathering worked on the surface, removing some of the rock that had formed on the sea floor. This continued for millions of years, with little material being deposited except by occasional rivers and floods. However, 400,000 years ago Britain (and the rest of the Northern Hemisphere) was in the clutches of a major ice age (called the Anglian Glaciation). 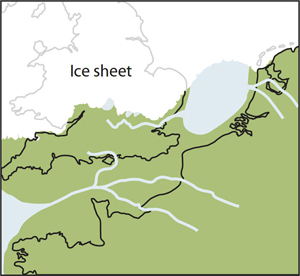 At this time an ice sheet covered most of Britain, and eventually, as the ice melted and retreated, dumping sediment, meltwater streams left huge amounts of material over the landscape. These form the most recent deposits beneath our school. Slowly, a layer of soil built up over these sediments, and then in 1922 our school was built, on top of all that history! 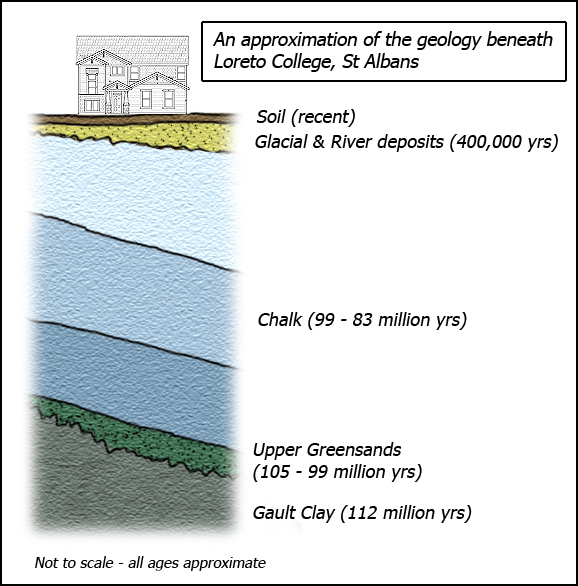 So the next time you’re sitting on the front lawn, spare a thought for what’s beneath you, and where St Albans has been over the last 112 million years.